Hungarian writer and foreign correspondent Sándor Jászberényi has an article (subscriber’s only though I managed to read it free the other day) on the death of a Kurdish Peshmerga fighter he had met and the particular significance of her being a woman. It’s a very powerful story and reminiscent of the writing in his story collection The Devil is a Black Dog, which is being published next month. B O D Y has already published two stories from the collection and will be devoting a week to Jászberényi’s work, including three stories, some of the author’s photography and a review of the book. Editor of the recent Words Without Borders’ Contemporary Czech Prose issue, Alex Zucker, has posted his translation of a Czech statement of protest on the state of the country’s politics 25 years after the Velvet Revolution. While some of the complaints expressed are fairly universal in our world of decrepit, corrupt political scumbags, there is a specific emphasis on the country’s current powers-that-be (both “left” and “right”, distinctions which it explicitly states have become meaningless in Czech politics) shamelessly abandoning the values of 1989. The BBC broadcast a talk with two Polish crime writers – Zygmunt Miłoszewski and Joanna Jodełka – and it will be available to listen to for the following month. 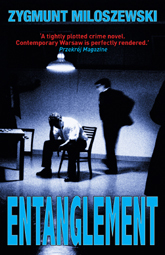 Miłoszewski is the author of Entanglement and A Grain of Truth, both translated into English by Antonia Lloyd-Jones. Jodełka’s novel Polychrome was translated by Danusia Stok and published in 2013. They both talk about some of the particulars of Polish society and history that make up such an important part of their books as well as the expectations and possibilities of the crime novel. Miłoszewski, incidentally, announces that he’s finished writing crime novels, though at least English-speakers can (I hope) look forward to more translations of his already-published work. Definitely worth listening to.